Love farming? Want to make money from it? Here is a little more about me I would Be HONOURED to work with you! Check out this FREE info package! Click to get Info Package! Normally 100.00 value.....FREE thanks to Sponsors! This is going to be one ACTION packed day! If you are a farm, or want to be a farm, or dream of farms in your sleep... or even in the day time, and people look at you funny - THIS is for you! 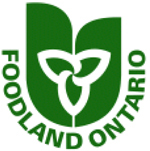 If you get ANY food at all from a farmer - Waterloo Region is a LOCAL hub, so I know you all love your farmers and I know you all have them... so get their butts to Elmira (they probably will have maple syrup or something, I hear its just dripping down the streets). It is in your best interests to have your farmers THRIVING and actively building their client base and product offering. This even will ensure you get great inside tips on how to market a farm (something not even top marketing executives could even begin to understand, so don't worry your not the only one! 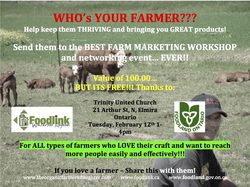 ), you'll be able to participate in a networking event with some of the most successful local farm marketers in Waterloo Region and beyond, you'll hear different techniques and you'll be able to participate in a discussion that will ensure Foodlink is able to meet any challenges you currently have or anticipate having.